1. Angelina Jolie and Brad Pitt: Yo Gabba Gabba! 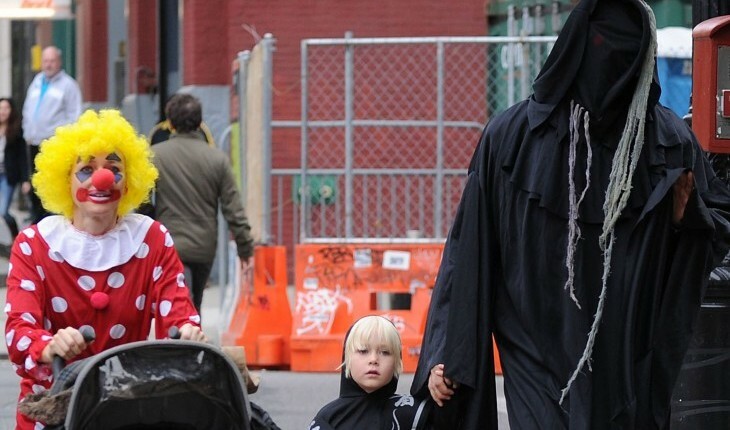 RadarOnline caught Brangelina and their brood trick-or-treating in the Los Angeles area on Halloween night last year. Pitt looked hilarious dressed up as DJ Lance Rock from the kids TV show Yo Gabba Gabba! His celebrity love went as the walking dead, while Maddox was a dead army soldier, Zahara was Batgirl, and Shiloh was a jet fighter. 2. Jessica Alba and Cash Warren: This married celebrity couple got festive with their two daughters, Honor and Haven. Dressed in costumes, the family of four were seen trick-or-treating in their Pacific Palisades neighborhood. Warren looked great as Superman, while Alba wore a cute cat outfit. Honor was the one who stole the show, though, in her Princess Ariel costume. 3. Sarah Jessica Parker and Matthew Broderick: Twin sisters Tabitha and Loretta looked absolutely adorable in their Halloween costumes last year as they headed out trick-or-treating in New York City’s West Village. The adorable tots were joined by big brother James Wilkie — dressed as Finn from Adventure Time — and their dad. Unfortunately, Parker was not with the festive group. 4. Deborra-Lee Furness and Hugh Jackman: Ava Jackman was spotted with her mom in New York City last year. The adorable daughter of the Wolverine actor dressed up as a squirrel as she went trick-or-treating in their Manhattan neighborhood. Meanwhile, Jackman and big brother Oscar were spotted collecting candy with a group of friends. To read more about the these celebrity kids and families during their spooky escapades, you can read the full article at CelebrityBabyScoop.com. Which celebs would you like to see at your door this Halloween? Tell us below.